Attention all deal seekers, from 12/5-12/24 select kitchen gifts at Family Christian are 40%! With this deal you will get more bang for your buck and you can even treat yourself to a little something. There are so many things to choose from and such a wide variety of options. I adore coffee mugs. I make a point of trying to buy one whenever I take a trip. I love the Christmas mugs shown above. I can picture myself feeling inspired by the message each morning. They are normally $19.99, now $9.99. That's a great price on a gift for the coffee lovers of your family. I enjoy making homemade gifts. One thing I occasionally do is make bread to give away. This baking pan is so cute and festive. It totally makes you want to make something special to give to a loved one. It's on sale for only $2.99. Taste and see cutting board. Another item I recommend is this beautiful cutting board. I am dangerous with a knife and terrible at cutting up vegetables & fruits. I think this is a great verse to read while you are working with dangerous utensils. Well, dangerous for me anyway. You can pick it up for only $11.99. 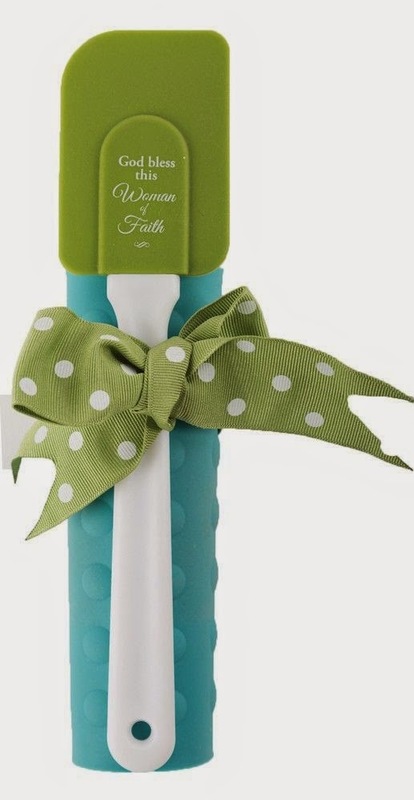 Finally, a great stocking stuffer would be this cute Women of Faith kitchen set. It's the perfect size for a stocking stuffer, so husbands check it out. There are lots of great kitchen sets to choose from. You can even find one to match your kitchen. For only $4.79, you can pick up a few! Head on over to your local Family Christian store, or visit them online to take advantage of these special offers.